Acoustic Sonifications are physical objects designed to make sounds that convey useful information about a dataset of some kind. Unlike other sonifications, they do not require a power supply, and the sounds are interactively produced in real time through physical interaction with the object. 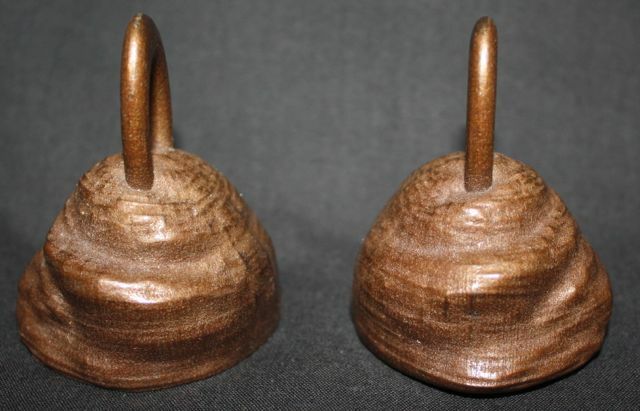 The Acoustic Sonifications in the shape of bells, shown in the image below, have been digitally fabricated from a dataset that describes human spatial hearing. Because humans have uniquely individually shaped ears the idea is that the sounds made by the bells could also be uniquely different and could be useful for comparing and analysing similarities and differences in HRTF datasets from different subjects. The HRTF measures the way sounds change when they come from different directions around a person. These changes are used by our auditory system to locate where a sound is coming from. The shape of the outer ear has an important effect on localisation of sounds, and because each person has individual and uniquely shaped ears their HRTF is also individual and unique. These bells shaped from an individual person’s HRTF are therefore specific to them, and so to is the sounds the bells make when rung. In fact each bell also sounds slightly different because your ears are not exactly identical in shape either. Have a listen to these Acoustic Sonifications of a human subject’s HRTF functions. The audible differences in the Left and Right HRTFs of one subject support the idea that bells fabricated from another subject will be distinguishable and perhaps even identifiable.